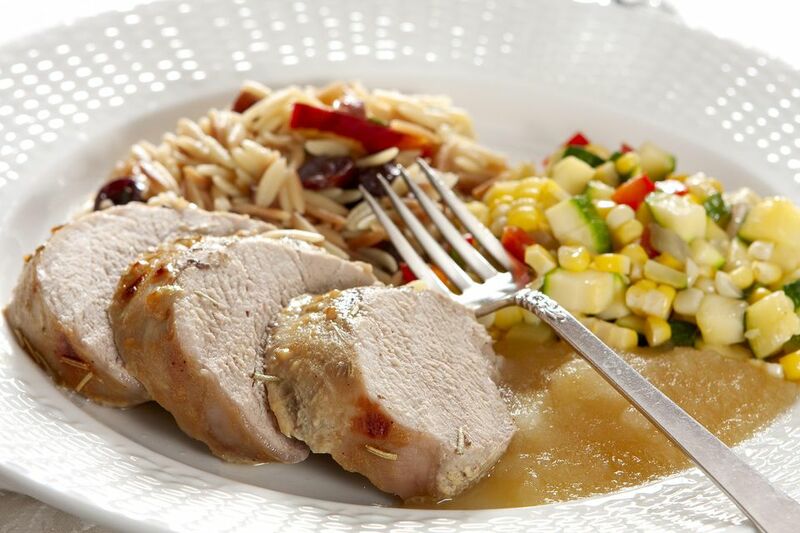 Lemon thyme pork tenderloin is a wonderful recipe for entertaining. It's so easy and has the most fabulous flavor and moist and tender texture. Make sure you are buying pork tenderloin, not a pork loin roast. When you buy the pork, make sure it hasn't been marinated. Pork tenderloin comes in many different flavors these days, from chili to Tex Mex to basil and herbs. Buy a plain tenderloin for this recipe, or the flavors will be too intense. To trim a pork tenderloin, you need to remove the silverskin. That is a thin, almost transparent layer of fat on the meat that will not melt when the meat is cooked. Start cutting away the silverskin with a knife, then use a paper towel to grasp it and use the knife to cut it off the meat. Discard the silverskin, then trim away any visible fat. The lemon juice in this recipe is acidic and will make the pork even more tender. Don't let the meat marinate longer than 24 hours or it may become mushy. Serve this recipe with a rice pilaf, some mixed vegetables and a green salad for a delicious dinner. Pierce the tenderloin all over with a fork and place in baking dish. Mix remaining ingredients and pour over pork. Cover and marinate in the refrigerator for 2 to 24 hours, turning pork once or twice. Or just let the pork marinate at room temperature for 15 minutes. When ready to cook, preheat oven to 350 F.
Place the two tenderloins on a shallow baking pan, at least 2" apart. Roast for 35 to 40 minutes until pork registers 145 F on a meat thermometer. Let stand 5 minutes, then slice to serve. Pork will be light pink in the center.